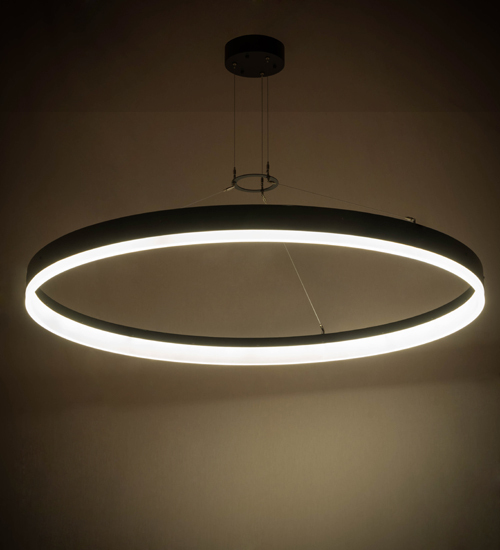 Description: A sophisticated ultra-modern lighting element features a refined design and advanced technology. A stellar ring offered in Contrail Mist Idalight provides ambient lighting with integral LEDs for energy savings and quality illumination. The pendant is enhanced with a solid steel frame and hardware finished in a stunning Black Powder Coat and supported by sturdy spacecraft cables. Custom crafted by highly skilled artisans in our manufacturing facility in Upstate New York, Anillo is available in custom styles, colors and sizes. Dimmable lamping options are available. The fixture is UL and cUL listed for damp and dry locations.